Only four weeks until the Oyster Pick-up! Actively dunk each cage up and down in the water to remove accumulated silt and sediment. Leave the cages on the dock for about 90 minutes to let the Sun and wind dry and kill the fouling organisms. Set a timer so you don’t forget to put your cages back in the water – it’s easy to get busy and forget. 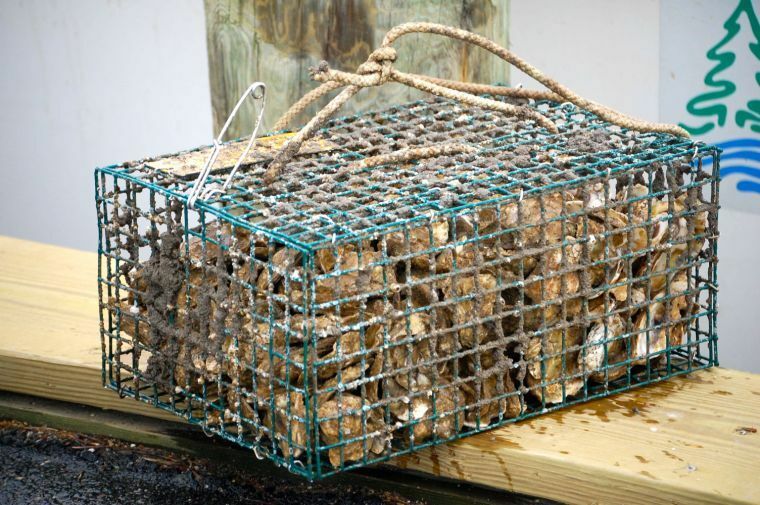 Give the cages a good shake to keep the oysters from growing together and make sure the oysters are evenly distributed on the bottom of the cages before you put them back in the water. If you would be interested in being one of our volunteers to help pick up the oysters, we will gratefully accept your help. We have 33 pre-planned routes for the oyster pick-up. So, we need a total of 33 pick-up trucks and/or cars with trailers. We like to have two people on each pick-up team. Therefore, we need a total of 66 volunteers. As of Monday, April the 30th, we have 7 trucks and/or cars with trailers and 15 volunteers. We need 26 more trucks and/or cars with trailers and 51 more volunteers! With everything we do, we try very hard to do it right and have fun while we do it! When it comes to the pick-up and delivery of your oysters, we try to be highly organized. We want to make sure that everything is pre-planned to help ensure that our volunteer’s time is not wasted and that there is not too much work for any one volunteer. We provide all of the tools necessary for the work at hand. We provide written, detailed, pick-up and delivery routes and directions and we provide refreshments for all in attendance. The more volunteers we have, the more fun it is and as a result there is, of course, less work for each volunteer. If you have a pick-up truck or vehicle with a trailer and would like to be one of our “Oyster Chauffeurs”, please let us know. Please call Julie at 410-822-9143. Julie handles all of the logistics for the pick-up and deliveries and does an outstanding job. TEXT MESSAGE ALERTS – PLEASE SIGN UP! For our oyster pick-up this year, we have 385 growers whose docks we have to visit. Due to the exponential growth of our program over the last seven years, logistics regarding quick and efficient communications with you have become somewhat of a challenge. It would help us tremendously if everyone could sign up for text message alerts for our Oyster Pick-up and Delivery. Simply text the word “oysters” to the following number: 31996. We thank you in advance for helping us with this one small favor. Oyster Pick-up: CONFIRMED – Friday, June the 1st. We will begin picking up oysters from our growers at roughly 9 a.m. and should be done by about noon. While it is not an absolute necessity for you to be there when we arrive, we do prefer for you to be there if you can. Our volunteers will initially meet here at my office on Commerce Drive and will deliver your oysters to Easton Point where they will be transported by boat to a sanctuary created for us by the State four years ago on the Tred Avon River. Please feel free to join us at Easton Point around 11 a.m. to see all of the oysters before they are planted. Our volunteers thank you, in advance, for all of the time and effort you have put in to maintain your cages. It makes their jobs much, much easier! OUR VOLUNTEERS WILL BE LEAVING YOUR CAGES ON YOUR DOCK WHEN THEY ARE DONE. From there, you can do a final, thorough cleaning of the cages and either leave them on the dock or move them somewhere on dry land until they are needed when we deliver your next batch of oysters in September. Oyster Social: Thursday, June the 14that 5:30 p.m. Formal invitations will be mailed to you several weeks beforehand. RSVP’s will be required.